Pakistan is one of the potential markets for air conditioners in the Asia-Pacific region; led by rising investments, public & private infrastructure development as well as government “Vision 2025”, which would drive government spending in several sectors such as housing, infrastructure, commercial, hospitality, manufacturing, education, and healthcare. To support the vision, a MoU was singed- “China-Pakistan Economic Corridor (CPEC)” between China and Pakistan, in which China would be investing more than $100 billion by 2017. According to 6Wresearch, Pakistan air conditioner market size is projected to grow at a CAGR of 7.2% during 2017-23. Despite political disputes and security concerns, Pakistan air conditioner market is growing at a healthy rate owing to increasing disposable income and expanding middle class population. Income of households in Pakistan have eventually increased owing to growing working population resulting in high purchasing power, which is further contributing to the growth of air conditioner market in the country. The county's economy is anticipated to grow over the coming years owing to rise in government spending on infrastructure development, Foreign Direct Investment and growth in domestic investment. Over the next six years, centralized air conditioner, particularly VRF segment is likely to demonstrate substantial Pakistan air conditioner market share due to increasing construction activities in the commercial sector. Split air conditioner segment has dominated the overall air conditioner market due to high demand arising from the residential sector. Punjab & Sindh provinces are the key revenue contributing regions are likely to dominate Pakistan air conditioner market forecast revenues over the coming years. The Pakistan air conditioner market report thoroughly covers the air conditioner market by types, applications, and regions. 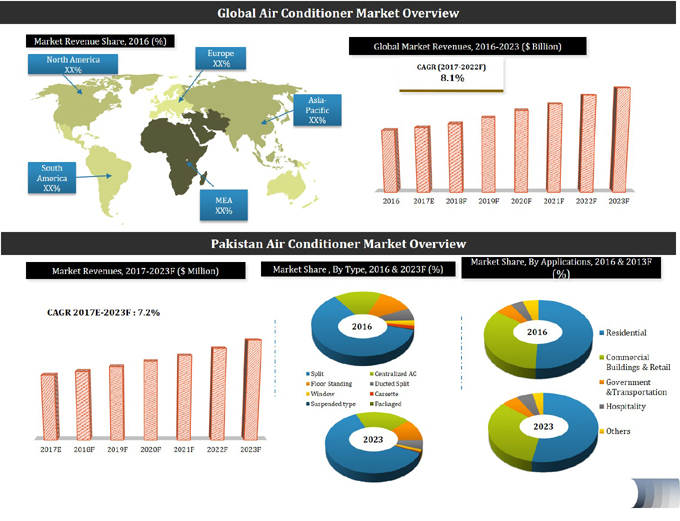 The Pakistan air conditioner market outlook report provides an unbiased and detailed analysis of the Pakistan air conditioner market trends, opportunities/high growth areas, market drivers, which would help the stakeholders to decide and align their market strategies according to the current and future market dynamics. 13.3 GREE Electric Appliances Inc.